Baby Care Expert Rachel Waddilove has created some thoughtful advice for when your baby has trouble sleeping. There are methods to help if you have a baby who is three months or older and is not sleeping well, or will only settle on the breast. Rachel provides solutions for sleepless nights. 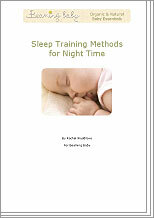 Help and advice for helping your baby to sleep through the night.